Michelle is available for private lessons, choreography consultations, competition coaching and birthday/bachelorette parties. Michelle loves traveling and sharing her passion for teaching and has traveled extensively through Europe, Africa, Asia, South America and North America. She offers a number of signature workshops, detailed below, and can customize to any level or timing request. She can also create custom workshops based on request. To find out about availability, pricing and fees, contact Poles On Tour. This is Michelle’s signature class. Step outside the proverbial box and bring a contemporary flow to the pole. This workshop will be floor-based (few aerial on-the-pole moves). We will work around the pole using levels - jumps, rolls, spins, etc., taking inspiration from contemporary dance with the requisite dash of sexiness we cannot escape! This class can be offered to all levels, but at least a beginner-level of pole dance skills is preferred. *Wear pants, leg warmers, t-shirt, etc. This class is a tricks-based class where Michelle will teach her current, favorite and most popular pole tricks and combos. It will begin with Michelle’s signature warm-up, ensuring all muscle groups are ready to pole before addressing the students’ specific needs and personal attention. * Can be taught at different levels/classes and it is preferred all students are at the same beginner, intermediate or advanced level. Need to get to that other pole and don't know how? Walking is not an option! As pole dancers, the floor is often the neglected space between the poles. Utilize the floor space to continue your movement and creatively pass to the other pole. We will work on floor work fluidity and style and floor-to-pole transitions. The floor is a great way to bring unique and dynamic movement to your pole dancing. Learn how now! * Wear pants, legwarmers, socks, knee pads, etc. This workshop will provide you with tons of spins and transitional work to enrich your pole dance repertoire and fluidity. You will learn how to maximize your power to create long-lasting and dynamic spins and spin combos. It is floor- based workshop—you can probably wear your pants and leg warmers the whole time. You will learn how to put several spins together in seamless flows as well as create unique variations on basic spins. All spin all the time! Once you have the the strength and control you need on spin mode, we will begin to create both fluid and dynamic flows using Int/Adv moves on the spin pole. Learn how to manipulate the spin mode and grow your spin pole vocabulary with swivels, speed, extension and unique poses and tricks you can only do on spin mode. students are at the same beginner, intermediate or advanced level. Learn the secrets to Michelle’s unparalleled, stunning performance quality that has been described as “ferocious,” “hypnotic” and “disarming.” You will learn a routine, with an emphasis on music and movement dynamics, facial expressions and audience captivation. This is your time to dance it out! 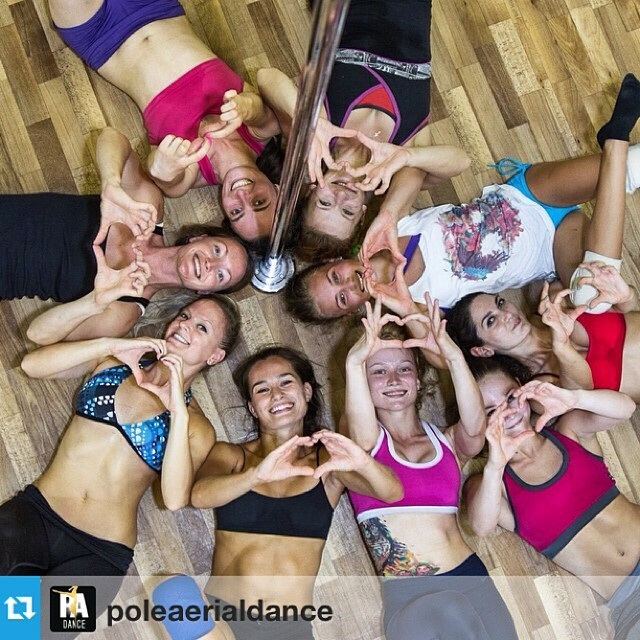 Vertical, horizontal, straddle, Jade, Chopsticks, Russian...how many ways can you show off your split on the pole? This workshop will go over a variety of split tricks, graceful ways into and out of them and how to put them together! We will also focus on stretches for splits to achieve full and over-splits as well as the tricks to make it *look like* you are in a full split! *Can be taught at different levels/classes and it is preferred all students are at the same beginner, intermediate or advanced level. Imagine a song or a piece of music that was just one note. The whole song. 3 minutes of only B sharp...you'd fall asleep or walk out! Your dance must be the same. Learn how to vary your movement, explore dynamics and capture an audience's rapt attention. This workshop will explore the nuances of movement, dive deep into movement exercises to broaden your repertoire and allow you to break out of your comfort zone and apply different dynamics to the same movement to create different effects. The best performance has both clean, strong tricks as well as audience engagement. Find out how to incorporate both in this interactive, exploratory and rich workshop. It is very important for every pole dancer to improve their flexibility. This class, loosely based on Michelle’s flexibility and contortion classes in NYC. It will challenge each dancer to deepen their flexibility in their entire body but especially those areas needed to execute pole tricks—rib to knee muscles including hip flexors, chest, shoulders, hips, groin, hamstrings and back. It is challenging to each individual’s flexibility level and offers valuable exercises and tips to continue in their own practice.